Let me start by acknowledging the Traditional Owners of the land on which we are meeting today, the Kaurna people. I pay my respects to their elders, past and present, and acknowledge their connection to this land and their continuing contribution to the life and culture of this place. Let me also at this time recognise our Members, our Affiliates, our event sponsors, and all of the delegates attending Congress this year. I thank you for your support and your commitment to age services in Australia. A special thank you to our Congress Platinum sponsor Anwar and the team at MyRecruitment Plus. We thank you for supporting this event. We say it every year, but once again this is literally the biggest Congress to date – with more than 1,200 attendees. We have around 100 speakers lined up for you and just under 150 exhibitors in the trade expo. In addition to the hundreds of delegates from around the country, we also have guests joining us from the UK, the US, China and New Zealand. Welcome to one and all. We have a comprehensive program for you that will keep you absorbed and engaged throughout the next two days, from breakfast through to dinner, with concurrent sessions running across both days. And we have a ‘program within a program’ with the introduction of the innnovAGEING Lounge and its program of speakers in the exhibition hall. I can confidently say that you will have no trouble finding plenty to interest you across such a vast program of topics and high calibre speakers. This year’s Congress theme is ‘Ageing Transformed…The Dawning of a New Era’. We got a sense in our panel session yesterday about what the new era looks like, but after hearing from our keynote speaker Dianne McGrath about what it might be like to travel to Mars on a one-way mission, it got me thinking about what our world would look like if we were to view it from Mars today. What would we see looking back at Earth? We would see a planet with a thriving civilisation with its burgeoning population placing mounting pressure on the world’s resources and its systems. We would see conflicts and inequities, but also great innovation, advances in technology and medicine that helps us as a species to live longer and even expand our horizons beyond the Earth. We would also see a global population that is ageing. With the Global Megatrends Institute forecasting that by 2020 the number of people aged over 60 years on our earth, will be greater than the number of children younger than 5 years of age. If we focus in on the wide brown land in the southern hemisphere we can see a vast continent that is still relatively empty, with most of the people congregating in a few big hubs on the coast. If we look closer, we can see that the population of this relatively wealthy island nation is rapidly ageing – around 2,000 people turning 65 every week and around 1,000 people turning 85 every week. And more than 1 million older Australians accessing services across our aged care system every year. With the demand for services increasing, as is the cost of providing these services. Among this ageing population, we would see great diversity including Indigenous Australians, different cultural and religious groups, LGBTI Australians, those who battle disadvantage in various forms, and those who live rural and remotes areas of our vast nation. All of them deserve, and many of them seek, choice in their care options and to enjoy a high quality of life. All of them desire to AGE WELL. And as our Chairman said yesterday, to age well is enable older Australians to continue to do the things that are meaningful to them, to have their spiritual, emotional and physical needs supported, and to maintain their connectedness to others and their communities. It is in this context that our industry must strive to support older Australians to live the lives they choose. This compels us all to have the courage and foresight to re-imagine the industry from simply providing aged care to supporting older Australians age well. Making this transformation from ‘aged care’ to ‘ageing well’ is a bit like Dianne going to Mars on a one way ticket – we know where we’re going and we know there’s no going back. We’ve already started on the journey and the challenge now is to keep moving forward – working together as an industry to make the changes to the system that are necessary to get us there, to deal with challenges and obstacles along the way and never lose sight of the goal, which is to make ageing well the new normal so that when we look back from Mars we can say that in Australia, we got it right!. But what does this mean in practical terms? Well, that’s one of the reasons we’re here today, to learn and to share leading practice so that we can all move forward together. The first step on our journey is to acknowledge as an industry, that there have been faults and failures. These have been brought to light in recent times and will continue to be identified and scrutinised over the course of the Royal Commission into aged care quality and safety. We all want a safe, high quality, high performing and sustainable aged care system. Older Australians need it, and older Australians deserve nothing less. The Royal Commission offers our nation and our industry the opportunity to make the aged care system better. Specifically, an aged care system that delivers accessible, affordable, quality care and services for all older Australians. The indicative timeline the Royal Commission’s final report is April 2020. In reality this is up to the Commissioners to determine and the process should take as long as it needs, in order to realise the desired outcome of making Australia’s aged care system better. Workforce: translating the intent of the recently released aged care workforce strategy into action and outcomes. So let me address each of these in turn. The primary objective of the Living Longer Living Better aged care policy reforms is to enable older Australians to age in place. That is, to age well in their homes and communities, connected to families and friends. The primary program to deliver this objective is the Home Care Program. In February 2017 the Home Care Program embraced the principles of consumer choice and consumer directed care through the Increasing Choice in Home Care initiative. This saw a fundamental shift in control of Home Care Packages from service providers to consumers. Whilst our industry has embraced this reform, there are significant unresolved issues being experienced by consumers and providers alike. Specifically, it is incredulous that with the desired policy outcome of ageing in place, we find today that there are over 120,000 older Australians assessed as requiring care in their homes, but unable to access this care – either at all or at their assessed level of need. To put this into context there are around only 80,000 subsidised home packages in the system and these are fully subscribed. Notwithstanding LASA’s advocacy on this, and other Home Care reform related issues, the Government has yet to effectively address this critical issue. Quality regulatory system and processes are transforming as we move towards the establishment of the new Aged Care Quality and Safety Commission from 1st January 2019. The Commission will bring together the functions of the Aged Care Quality Agency, the Aged Care Complaints Commissioner and the aged care regulatory functions of the Department of Health. The new Aged Care Safety and Quality Commission, along with the new Aged Care Quality Standards will provide a strong backbone for quality outcomes in aged care. The Commission must be held accountable for a world-class regulatory framework delivering on risk identification and management, consistency and transparency, and robust, timely and fair complaints management systems and processes. These changes, alongside the introduction of unannounced re-accreditation visits that came into effect on 1st July this year, will drive quality improvements in the aged care system and help restore confidence for the community and industry alike. Whilst these changes are underway, LASA members are reporting concerns with the current regulatory system. Reports of inconsistent interpretations of the quality standards resulting in incidents of non-compliance are re-emerging. LASA led action on these issues in late 2017 which resulted in productive engagement between providers and assessors. However, it appears more work is needed. Resolving aged care funding for the next two decades as our country transitions to supporting the Baby Boomer generation to age well, is critical. Ultimately, what Australia requires is the development of a long-term, sustainable funding strategy to ensure Australia’s aged care system is well equipped and resourced to meet the needs of older Australians. Appropriate and sustainable funding is vital to implement leading practice models of care across Australia, particularly in rural and regional settings, where access to staff can be limited and there can be higher costs for the provision of services. Recognising the true costs of delivering age services and providing realistic funding is the only way we can guarantee a sustainable age services industry that meets the needs of all older Australians. The fact is that the residential aged care industry has had around $3 billion less in funding over the past five years than it would have had under previous funding arrangements. Yet it has also had to meet the care needs of, not only an increasing number of older Australians, but older Australians coming with more complex needs. In short, funding is residential aged care has not kept pace with costs and this must be addressed as a priority. This is evidenced in an independent report this month by industry analyst Stewart Brown, said that regulatory changes and funding pressures have led to a disturbing statistic of more than 45 per cent of residential care facilities reporting a before tax operating deficit for the 2017-18 financial year. The report stated that for facilities operating in rural and regional areas this figure is around 63%. And across the industry there are around 21% of facilities reporting a cash loss from operations. The Stewart Brown report also acknowledged growing financial pressures in the Home Care market. The report observed that we are seeing continuing trends in Home Care that show declining revenues, rising costs, and growing unspent funds balances. Whilst in response to industry advocacy there have been some incremental funding responses from Government for Residential Care and Home Care in recent times, the Stewart Brown figures, and the financial pressures they reveal, clearly show that the current funding model is inadequate, and that the industry requires significant and urgent investment. LASA, in collaboration with other peak bodies, has called on Government to urgently address residential care and home care financial pressures. And to work with industry to explore sustainable and robust solutions to the funding and operational business models. All sides of Government are well aware of the core funding issues faced by our industry. However, it will take political leadership and longer term vision and budgetary commitment to address the fundamental funding issues. We must get on with funding reform as a matter of priority while the Royal Commission proceeds. Our industry has a dedicated and professional workforce of around 350,000 people who overwhelmingly deliver good quality care 24 hours a day, seven days week, year in year out, to over 1.3 million older Australians. This is something our industry is immensely proud of and something our nation is very grateful for. The Prime Minister summed this up recently when he stated that “the vast majority of Australia’s aged care services and their dedicated staff deliver outstanding care”. Notwithstanding this, we need to work towards ensuring all providers have the right numbers of staff, with the right mix of skills, to meet the different needs of every individual they care for and support. This applies to every different type of care setting, be that someone’s family home, a retirement village or a residential aged care facility. Measures to attract, retain and develop the aged care workforce… including consistent qualifications and appropriate pay for what are very important jobs. We agree with this approach. Getting these elements of workforce right is a priority in order to make Australia’s aged care system better right now. Workforce development is of critical importance to the age services industry and I am delighted that the author of The Aged Care Workforce Strategy, Professor John Pollaers, will join us tomorrow afternoon to lead a discussion on workforce in the new era. 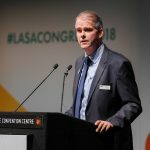 On a final note with regards to workforce matters, I would like to say a special thank you to Ian Hardy, CEO of Helping Hand here in Adelaide, for accepting LASA’s nomination as our representative on the recently established Aged Care Industry Reference Committee. This Committee was a recommendation in the Workforce Strategy and we are pleased to be proceeding at pace with this initiative. So, the aforementioned issues across access, quality, and funding of age services, as well as workforce issues, will be our key focus areas in the near term. Looking further ahead, the future of Australia’s aged care system will be shaped by the outcomes of the Royal Commission. It will play a key role in identifying how to make Australia’s aged care system better. Make no mistake, this will be a forensic and at times painful investigation where there will be examples of unacceptable care brought to light. The Royal Commission process will be necessarily open and transparent to allow older Australians, their families and advocates, aged care workers and aged care providers to be able to come forward and tell the stories of their lived experience of Australia’s aged care system. It is significant that the preamble to the Terms of Reference for the Royal Commission recognises the contribution of older Australians to society and that older Australians deserve high quality care in a safe environment that protects their well-being and dignity. It goes on to highlight the importance of building a national culture of respect for ageing and older persons. This is fundamental to Australia as a nation better supporting the growing numbers of older Australians to age well. This is a theme that we touched on in our discussion yesterday. I look forward to the further important discussions about the Royal Commission that we will have over the next couple of days. For LASA, we will also continue to focus on our core business. That is, providing a strong voice and a helping hand for all providers of age services. This year LASA has expanded its Membership base by achieving a 20% increase in our membership. We have continued to provide strong advocacy on many complex policy and regulatory issues, while delivering an expanded range of services to Members. LASA’s leadership in the aged care industry focused on achieving a proactive and pragmatic approach to driving sector reform, performance and sustainability. Our activities and achievements over the past year were presented at our AGM yesterday and detailed in our 2017/18 Annual Review document –which is available online. Pleasingly, our efforts to support our members are best reflected in the results of our recent Members’ Satisfaction Survey where we achieved an overall satisfaction rating from our Members of 89%. This is an outstanding result and reflects the work our team does every day to provide our Members with a strong voice and a helping hand in a time of unprecedented change in our industry. At Congress 2017 I announced a number of new initiatives to support our Members. These being: a new daily media watch service; reciprocal membership for LASA Members with the Global Ageing Network; the LASA purchase power program which provides our Members with significant discounts on a range of products and services; and, the establishment of Australia’s first dedicated age services innovation network – innovAGEING. I am very pleased to advise that each of these initiatives have been implemented as planned and they have been well received and supported by our Members. Looking ahead I am very delighted to announce four new initiatives that will be of benefit to our Members. Building on the success of innovAGEING’s online collaboration hub – the innovation lab, LASA is proud to announce the launch of our online Communities of Practice. LASA’s Communities of Practice provides an online platform for Members with shared interests to communicate as a network on key issues, pose questions to their peers, discuss operational challenges, share innovative solutions, and support each other in their work day to day – all within a shared and facilitated online environment. Access to LASA Communities of Practice is for LASA Members only and will add significant value to our Members, particularly for staff at the operational level. LASA’s COPs are provided to LASA Members as part of their standard membership. There is no additional cost for LASA Members’ and their staff to participate in the COPs. To get the ball rolling, the very first LASA Community of Practice to be established is in the critical area of Clinical Governance. This COP will provide a place for nurses and other clinicians in our industry to discuss and explore key clinical governance areas such as: risk management; clinical auditing; staffing and staff management; education and training; clinical effectiveness; clinical information; and, stakeholder engagement. The Clinical Governance COP will be moderated by LASA’s Member Advocate – Nigel McGothigan. Nigel is an RN with some 25 years of diverse clinical experience, of which 15 years has been in the age services industry. Nigel has also served as a clinical advisor to the Australian Council of Health Care Standards. This COPs other moderator will be LASA’s Member Services Coordinator in QLD – Chris Edith. Clinical governance will be the first LASA COP. Further COPs are planned and we will be engaging our Members for their views what these COPs should focus on. Further details on LASA Communities of Practice and how to get involved will be shared with Members post-Congress. LASA is very excited to share with our Members a new partnership that will be of significant value. LASA has partnered with Universal Care Training (UCT) to expand and extend our suite training courses for LASA Members. Our partnership with UCT builds on LASA’s existing accredited training courses offered through the LASA Aged Care Training Institute. Through this partnership LASA can now offer our training programs both in-person and online. The online delivery options developed directly respond to needs expressed by many of LASA Members. Furthermore, our training programs can also be developed specifically for individual organisations and delivered on site direct to out our Members staff and teams. Given the changing nature of compliance activities and outcomes across our industry, LASA is set to launch a national Nurse Advisor / Administrator Panel. We truly hope that our Members never need this service. However, the growing volume of sanctions and serious risk decisions in our industry indicates the inevitable need for this service. LASA has engaged a panel of suitably qualified and experienced nurse advisors and administrators who providers can engage and appoint should they be instructed to do so by the Department or the Quality & Safety Commission. Further information on this service will be communicated to Members in November. Finally, building on the initiative in 2018 of LASA Member, the Whiddon Group, LASA will lead and coordinate Australia’s ‘Aged Care Thank You’ day in 2019. This will be national day of recognition and celebration for each and every person who works in aged care in Australia. In planning for this national scale initiative, LASA will engage with our Members and other stakeholders across the industry to promote and coordinate a suite a related activities. This will be the opportunity for age services providers and the wider community to say thank you for the wonderful work the amazing staff in aged care do every day. LASA is really pleased to bring forward these new initiatives in the service of our Members. We look forward to engaging further with you on them. Finally, it would be remiss of me not to mention that sometime in the next six months or so there will be a federal election. LASA is presently considering our election campaign ‘game plan’ and we will also be engaging our Members for their input and support in this endeavour. So in closing, I’d like to personally thank our Members and our Affiliates for their support of LASA and their contribution to our mission to enable a high performing, respected and sustainable age services industry. I am very much looking forward to celebrating the very best our industry has to offer with the inaugural LASA Excellence in Age Services Awards at our gala dinner tomorrow night. I look forward to paying tribute to all the finalists and announcing our national winners. As we spend the next couple of days together, engaging with peers, absorbing new ideas, and learning and sharing our own ideas and experiences, I ask that that you consider the following. As we stand on the cusp of a new era for age services in Australia I urge everyone in our industry to work together to make Australia’s aged care system better. And, in the pursuit of this objective, to be inspired by the spirit of initiatives such as the Mars One program. That is, to boldly move beyond the limited thinking that presently constrains us. To see the challenges of the day as opportunities to look at things differently. And be inspired to find new and better ways for our industry to support older Australians to age well. This is what older Australians need – and older Australians deserve nothing less. We at LASA look forward to working with you, and for you, in this quest.